Who Cares? 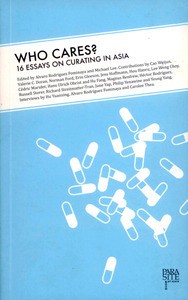 is an anthology that compiles 16 essays on curating art in and of Asia. One of the themes addresses the politics of care, commonly understood as the basic role of curators, with regards to art and artists, across time and contexts. Another theme revolves around markers of success in the realm of contemporary curating. A third recurring theme deals with curating in the globalised art world of advanced travel and communication technologies. A fourth theme reconsiders the audience as active producers in a curated experience. Through a variety of perspectives and literary styles, these texts constitute primary notes towards ‘curatorial criticism,’ a subfield of art criticism that identifies the new in curating today. The book includes essays by Hu Fang, Norman Ford, Hou Hanru and Michael Lee, among others, and is designed by seed | projects. This project is co-published by Para/Site Art Space, Studio Bibliotèque and seed | projects.